“Dressed in a black summer suit, white pocket square, and designer sunglasses, Willie Brown joined Mayor Ed Lee on June 26 in front of a wall-sized rendering of The Shipyards, a condominium community planned for the former Hunters Point Naval Shipyard. The occasion was a groundbreaking ceremony for 88 of 1,400 planned housing units, the first tangible evidence of what has long been envisioned as a $10 billion mixed-use development. k) -Government money spent to improve another of Willie Brown’s projects, or rather to make it possible. "This community will come alive," Brown said. "It will not be different than any other community in San Francisco except it will be newer, and probably better." During his turn to speak, Lee emphasized help from political leaders in routing government funds to the project. k) These creatures are Community criminals who specialize in stealing from the community under the guise of improving it. “Amid all the thank-yous and accolades, however, neither man mentioned the source of the private money that made the groundbreaking possible. Nor did they describe how government officials had spent the previous year helping position a little-known private firm to trade U.S. visa priority to foreigners who invest in one of the largest proposed public-private real estate developments in California history. “This reporter found that Lee's support has included having city staff members and the city's contract lobbyist work in concert with Pelosi, the House minority leader, to urge the U.S. Department of Homeland Security to allow the firm to operate under the federal EB-5 visa program. Named for a section of the U.S. immigration code, the 23-year-old program gives green-card priority to people who invest at least $500,000 in designated U.S. enterprises. The mayor's staff drew up letters, memos, and other material used in investment pitches and state permitting efforts by the firm. One of Lee's aides traveled to China to help the company market shares to investors. As for Brown, his exact role in the investment firm is a bit of a puzzle. He denies knowledge of it, yet the company's brochures and website call him a "principal." Ginny Fang, CEO of the San Francisco Bay Area Regional Center, says Brown is a minority partner. But when Fang wrote to Lee's deputies on July 4, 2012, making the case for lobbying the Homeland Security Department, she wrote that the center has three leaders: herself, Brown, and Steven Kay, secretary of the board for the Willie L. Brown Jr. Institute on Politics & Public Service (for which Brown serves as chairman and CEO). Like other private investment firms, the San Francisco Bay Area Regional Center's core business is to sell private shares, collect fees, reap returns, and pass along risk. The company first gained government recognition under the U.S. investor visa program in 2009 under the name Golden State Renaissance Ventures, founded by former East Bay law firm manager Eric Chelini. It has stumbled with some proposed ventures, such as a biotech incubator in the Dogpatch neighborhood. But the company picked up speed in 2011 as city and federal officials backed an effort to use it to jumpstart development at Hunters Point. It formed a partnership with Miami-based developer Lennar Corp. to act as a broker for foreigners, primarily Chinese, under the EB-5 visa program, according to company memos. Records show the regional center's managers are lining up $87 million in investments, and hope to eventually raise $300 million. The investments would be held by two separate corporations; in U.S. Securities and Exchange Commission filings, both name Kay as president. Meanwhile, company marketing materials emphasize Kay's role as president of the regional center, and as Brown's business partner and office mate. 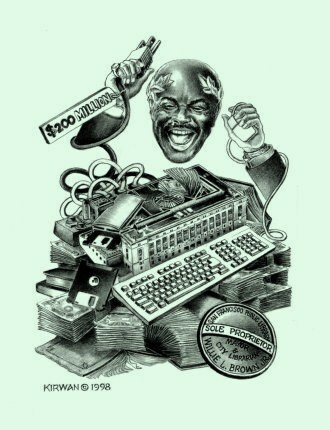 "Mr. Kay shares office space with former Mayor Willie L. Brown since Mr. Brown's exit from public life in 2004, and together they share and represent clients in the city of San Francisco and throughout the state in a myriad of matters," according to one regional center brochure entitled "Company Brief." "If I had to diagram this project, it would look like a family tree with lots of extra little problems," says Judy Nadler, senior fellow in government ethics at Santa Clara University. "Brown as chair and principal of this financial services firm stands to benefit financially, probably in a significant manner. So I'd say that the skeptic would look at this and say this pretty much looks like an inside deal." Fang took issue with the term "inside deal," saying that support for her firm was no different than other civic enterprises. She did not answer questions about Brown's potential financial stake. This spring, the regional center hired the Shanghai firm Visas Consulting Group to host a series of seminars in Chinese cities. The pitch to foreign investors emphasized the firm's links to political figures such as Brown as evidence that the firm is a sound investment. At an April 14 seminar in Shanghai, prospective investors — Chinese citizens considering seeking green card priority through the U.S. investor visa program — received glossy brochures illustrated with photographs of Lee and Brown. The investment brochures, like the online materials, refer to Brown as a company "principal." During the seminar, a presenter described Brown several times in connection with the regional center as "dong shi zhang," or "chairman of the board." Fang says Brown is not chairman but, after being provided a tape of the presentation, acknowledged that was what he was called. She offered no further explanation. A video featuring Brown led into the April 14 sales pitch. It was shown before a presenter told attendees that 50 investments already had been made, with 40 remaining. "I am Willie Brown, former mayor of San Francisco and, of course, former speaker of the California Assembly, and I am a principal in the San Francisco Bay Area Regional Center," Brown says in the video. "I am just delighted to be a part of this." But at a City Hall speech Lee gave on May 21, Brown brushed off this reporter's request to discuss the regional center. "You don't know what the San Francisco Bay Area Regional Center is?" "Nope," Brown said, before excusing himself. At the June 26 Hunters Point groundbreaking, Brown wound up the ceremony by touting the project's moneymaking potential. The regional center was never mentioned. "The investment opportunity here represents something that's unique in America," he said. "There is no other piece of soil as potentially lucrative and profitable for the public sector and private sector than this spot is going to be." Asked at the event what he expected the San Francisco Bay Area Regional Center's profit to be, Brown said: "I don't know what that is. I don't know what that is. I don't know what that is." Lee likewise initially claimed ignorance about the regional center. Asked at a May 30 ribbon cutting to comment on the San Francisco Bay Area Regional Center, he said, "I can't say that I have much detail on that." However, in an interview at the groundbreaking, Lee acknowledged that the first phase of construction would be financed by the regional center. The center's partner, Lennar Urban, previously installed streets and sewers at the Hunters Point project site but delayed construction, citing lack of money. "The ones taking the risk and putting infrastructure into the ground, that's Lennar," Lee said. "And they've been doing a really great job." Before the event, regional center CEO Fang said her company would fund part of the first phase of Hunters Point construction, referring specific questions to Lennar Urban. Company president Kofi Bonner, who served as San Francisco's director of economic development while Brown was mayor, did not answer questions. "We don't discuss financing," Bonner says. The regional center fundraising followed a government lobbying campaign to allow the Brown-linked firm to participate in the immigration visa program. In a letter to the U.S. Department of Homeland Security, Pelosi — a longtime Brown ally — wrote that "it would be in our national interest" to allow the firm to collect fees and returns under the investment visa program. The Sept. 18 letter sought to get U.S. immigration authorities to fast-track the regional center's visa program certification. It was part of Pelosi's efforts to bring jobs to low-income sections of her congressional district, her press secretary wrote in a statement in response to this reporter's questions. "By incentivizing private investment to the redevelopment of the Hunters Point Naval Shipyard, the shipyard will be transformed into a source of local jobs and economic into this disenfranchised community," the statement says. In her letter to Homeland Security, Pelosi wrote that the government so far has spent $1 billion at Hunters Point, with most of the money going to toxic and radioactive waste cleanup. The project still requires $3 billion to pay for infrastructure and $7 billion for planned apartments and office space, yet neither the city nor Lennar has been able to come up with the necessary funds, Pelosi wrote. According to Pelosi, U.S. Citizenship and Immigration Services needed to authorize the San Francisco Bay Area Regional Center to solicit funds under the Immigrant Investor Program, so the city could "proceed with the remainder of the project without delay." To that end, the City and County of San Francisco's lobbyist, Eve O'Toole, joined the effort last September, also pressing U.S. immigration officials to fast-track the application, according to internal emails. In March, Wells Lawson, Lee's aide overseeing the Hunters Point project, traveled to China and Japan for at least two weeks to help with seminars marketing shares in the company to potential investors. The regional center paid for all of Lawson's travel expenses, including more than $1,300 in plane tickets, says Leo Levenson, the city accountant who tracks government finances related to redevelopment projects such as Hunters Point. According to Lawson's presentation notes from the seminars, obtained through a public records request, he underscored the backing of government officials for the Hunters Point project. "This would not be possible without deep commitment at the federal, state, and county level and the extent of public investment cannot be overestimated," Lawson's notes read. "I invite you to be a part." Although Lawson was on the city payroll while in China, the city kept no financial records of the trip, Levenson says. Lennar ultimately reimbursed the regional center, Lawson said. Fang, the regional center CEO, also says the developer paid for the trip. Lawson says he simply was performing his government job, which is to try to ensure the Hunters Point project proceeds. The China trip was "a project cost. It's no different than if I went over to Sacramento to make a presentation to Caltrans about the project," he says. Fang also defended Lawson's involvement in the Chinese investment sales seminars. "The city is not selling the investment," she writes in an email. "It is legitimizing the existence of the project in its own self-interest." But while Shanghai seminar speakers touted the proposed Hunters Point redevelopment project, the advantages of a U.S. visa, and links to political figures, investors weren't actually being asked to buy any of those things. Instead, they were being sold shares in LLCs managed by Kay and Fang. "Promoting economic development in general, that's fine; that's their job; that's what they should be doing," Gibson says. "But they're going over to China not just to create economic development, but specifically to get investors to put money into securities." After he became San Francisco mayor in 1996, Brown pushed to redevelop the Hunters Point Naval Shipyard, which closed in 1988. With Pelosi's help, the federal government contributed to the $815 million cleanup of toxic and radioactive waste at the former base, she wrote in her letter to the Department of Homeland Security. But developer Lennar, which in 1999 was chosen by the city to develop the 770-acre parcel, has struggled in obtaining financing for construction of what was to be a $10 billion project. The last such failure came in April. Following a trip Lee made to China, the mayor's office confirmed that a proposed $1.7 billion loan to Lennar from the China Development Bank had fallen through. It would have funded redevelopment projects at Hunters Point and the former Treasure Island Naval Station. In an April 15 letter obtained from the city through a public records act request, Lee thanked Brown for joining him on the trip, where the mayor held meetings to discuss redevelopment at Hunters Point with Chinese officials. The letter was boilerplate, sent to the people who traveled with Lee. Brown's included a handwritten personal aside from the mayor: "Thank you for all your advice and support," Lee wrote. Lennar announced soon after the trip that the development would proceed despite failing to obtain the China loan, with 88 housing units to be built this summer and 159 more in the fall. Not included in the announcement was that, behind the scenes, Brown's allies in local and federal government had helped assure that funding would flow through the regional center, according to communications and other documents obtained through public records requests. For the Hunters Point deal, the regional center is asking for a $45,000 fee from each $500,000 investor, according to documents filed with the SEC. It intends to create an investment partnership with Lennar to build the first and second phases of a residential and commercial development at the former base. That development ultimately is to include 10,500 residential units and more than 4 million feet of retail and office space, according to investment materials and government documents. Eunice Edwards, a San Ramon real estate agent who had discussions with the firm on behalf of a client, says she was told that investors would earn a return of about 2 percent, be able to get their money back in five years, and have an option to buy a Hunters Point apartment at market rate “. Carolyn S. Lee, an attorney representing the San Francisco Bay Area Regional Center, emphasized that there is no conflict of interest in the arrangement. "So let's say the principal is Willie Brown, and he was a key fundraiser for the current mayor," she says. "So what? These are local businesses, and it's not unusual for public officials to support them." The EB-5 visa program has long been controversial. Since it began in 1990, it has been a perennial source of stories about immigrants who saw their investments evaporate and their visa applications denied. One repeated criticism has been that sales pitches don't focus on ordinary investing principles such as risk and rate of return. Emphasis instead is put on political support and the tangible benefits of a U.S. visa. During the Shanghai marketing seminar, one video featured Chinese citizens who had successfully immigrated to the United States through the visa program. "A few years ago, I was concerned about my son's education and wasn't sure what to do," said one videotaped woman who identified herself as Michelle from Guangzhou. "But now, I look at my son's education today and he's studying at the University of California at Berkeley." Lately, the immigration program has ballooned, expanding from 806 visas issued in 2007 to more than 7,400 in 2012, according to U.S. immigration figures. Troubles likely will grow as well, says Gibson, the EB-5 investment specialist. "In the next few years, there will be investors not given any capital or only a fraction of what they invested," Gibson says. "That's where we're going to see a lot of investigation." Already, litigation is emerging around the country. Last year, EB-5 investors filed a class-action suit in New Orleans, alleging misuse of funds in a case that still is pending. In April, a federal judge ordered a Chicago developer raising investor-visa funds to return the money after the SEC filed fraud allegations. San Francisco attorney Edward Lau, who specializes in the EB-5 program, obtained a fraud judgment earlier this year for three Chinese clients after an EB-5 developer — unrelated to the San Francisco Bay Area Regional Center — disappeared along with $3 million that was to be invested in a San Bruno restaurant. "If there is a major loss because of a regional center, attorneys go after everybody — everybody who's a conspirator, a cohort, everybody who's a participant in advancing the scheme itself," Lau says. Lawson, Fang, and others associated with the Hunters Point financing deal say working with a Brown-linked company helped the public by providing funds to a long-stalled redevelopment project. But in 2011 Lee campaigned for office amid opponents' criticisms that he was installed by, and was doing the bidding of, Brown. "Being able to expedite something is often the excuse for allowing these conflicts of interest to occur. 'Well, we know this person, and they've done well for us, so it will save us money in the long run,'" says Nadler, the ethics professor. "But of course what happens is that it doesn't do any good for the public's interest, and it makes the public believe there is something else going on which is not necessarily fair, not necessarily transparent. "You can say it's a great opportunity. But you could also consider it has the potential to be a huge liability."